Picture - The Spanish guerrillero Juan Martx�n Dx�ez, known by his nom de guerre, El Empecinado. Guerrilla warfare is a form of irregular warfare and refers to conflicts in which a small group of combatants including, but not limited to, armed civilians (or "irregulars") use military tactics, such as ambushes, sabotage, raids, the element of surprise, and extraordinary mobility to harass a larger and less-mobile traditional army, or strike a vulnerable target, and withdraw almost immediately. The term means "little war" in Spanish, and the word, guerrilla, has been used to describe the concept since the 18th century, and perhaps earlier. The tactics of guerrilla warfare were used successfully in the 20th century by-among others- Mao Zedong and the People's Liberation Army in the Second Sino-Japanese War and Chinese Civil War, Fidel Castro, Che Guevara and the 26th of July Movement in the Cuban Revolution, Ho Chi Minh, Vo Nguyen Giap, Viet Cong and select members of the Green Berets in the Vietnam War, George Grivas and Nikos Sampson's Greek guerrilla group EOKA in Cyprus, Paul Emil von Lettow-Vorbeck and the German Schutztruppe in World War I, Josip Broz Tito and the Yugoslav Partisans in World War II, and the antifrancoist guerrilla in Spain during the Franco dictatorship, the Kosovo Liberation Army in the Kosovo War, and the Irish Republican Army during the Irish War of Independence. Most factions of the Taliban, Iraqi Insurgency, Colombia's FARC, and the Communist Party of India (Maoist) are said to be engaged in some form of guerrilla warfare-as was, until recently, the Communist Party of Nepal (Maoist). In India, Marathas under leadership of Shivaji used it to overthrow of the Mughals. It was also effectively used by Tatya Tope and Rani Laxmibai in the Indian Rebellion of 1857, as well as by Pazhassi Raja of Kerala to fight the British. Guerrilla (Spanish pronunciation: [ɡeˈriʎa]) is the diminutive of the Spanish word guerra "war", literally "little war". It derives from the Old High German word Werra or from the middle Dutch word warre; adopted by the Visigoths in A.D. 5th century Hispania. In War and Peace (written in 1865-1869, in part about Napoleon's invasion of Russia), Leo Tolstoy says that guerrilla warfare is named after the Guerrillas in Spain. He appears to be referring to a specific group that used guerrilla warfare in a war fought in Spain before the 1860s. That war began in 1808 with the occupation of Spain by Napoleon's French army. Bands of guerrillas (so named; one of the most important led by Juan Martin Diez, Agustina de Aragx�n or Juana La Galana) and the normal Spanish army both fought Napoleon. Our modern word "guerrilla" traces its origin to these bands in this war. These guerrillas were very effective in fighting Napoleon. Their principal function was to disrupt the supply and communication lines of the French army by intercepting messages and by seizing convoys of supplies, arms, and money. 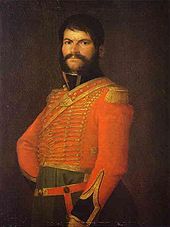 They did so much damage to Napoleon's army that Joseph Leopold Hugo, a French general, was ordered to "pursue exclusively" Diez and his guerrillas. According to Merriam Webster's Collegiate Dictionary, the word "guerrilla" was first used as a noun in 1809 and as an adjective in 1811. Guerrillero is the Spanish word for guerrilla fighter, while in Spanish-speaking countries the noun guerrilla usually denotes guerrilla army (e.g. la guerrilla de las FARC translates as "the FARC guerrilla group"). Moreover the term guerrilla' was used within the English language as early as 1809. The word was used to describe the fighters, and their tactics (e.g. "the town was taken by the guerrillas"). However, in most languages guerrilla still denotes the specific style of warfare. The use of the diminutive evokes the differences in number, scale, and scope between the guerrilla army and the formal, professional army of the state. So conscious of hidden marksmen was Burgoyne that he asked his men, ‘When the Lieutenant General visits an outpost, the men are not to stand to their Arms or pay him any compliment,‘ clearly aware he would be singled out. There is nothing in the purely military pages of Mao, Nguyen Giap, Che Guevara or other manuals of guerrilla warfare which a traditional guerrilla or band leader would regard as other than simple common sense. The strategy and tactics of guerrilla warfare tend to focus around the use of a small, mobile force competing against a larger, more unwieldy one. The guerrilla focuses on organizing in small units, depending on the support of the local population, as well as taking advantage of terrain more accommodating of small units. Tactically, the guerrilla army would avoid any confrontation with large units of enemy troops, but seek and eliminate small groups of soldiers to minimize losses and exhaust the opposing force. Not limiting their targets to personnel, enemy resources are also preferred targets. All of which is to weaken the enemy's strength; to cause them eventually to be unable to prosecute the war any longer, and to force them to withdraw. It is often misunderstood that guerrilla warfare must involve disguising as civilians to cause enemy troops to fail in telling friend from foe. However, this is a not a primary feature of a guerrilla war. This type of war can be practiced anywhere there are places for combatants to cover themselves, and where such advantage cannot be made use of by a larger and more conventional force. Picture - Boer guerrillas during the Second Boer War in South Africa. Since Classical Antiquity, many strategies and tactics were used to fight foreign occupations culminating in the modern guerrilla. An early example was the hit-and-run tactics employed by the nomadic Scythians of Central Asia against Darius the Great's Persian Achaemenid Empire and later against Alexander the Great's Macedonian Empire. The Fabian strategy applied by the Roman Republic against Hannibal in the Second Punic War could be considered another early example of guerrilla tactics: after witnessing several disastrous defeats, assassinations and raiding parties, the Romans set aside the typical military doctrine of crushing the enemy in a single battle and initiated a war of attrition against the Carthaginians that lasted until a change in leadership followed by the famous Battle of Cannae after which a terrible defeat there forced them to resume using the Fabian strategy. In expanding their own Empire, the Romans encountered numerous examples of guerrilla resistance to their legions as well. The success of Judas Maccabeus in his rebellion against Seleucid rule was at least partly due to his mastery of irregular warfare. The victory of the Basque forces against Charlemagne's army in the Battle of Roncevaux Pass, which gave birth to the Medieval myth of Roland, was due to effective use of guerrilla principles in the mountainous terrain of the Pyrenees. Mongols also faced irregulars composed of armed peasants in Hungary after the Battle of Mohi. The various castles provided power bases for the Hungarian resistance fighters; while the Mongols devastated the countryside, the Mongols were unable to take the castles and walled cities. In 1242, the Hungarians ambushed and destroyed two toumens of rearguard troops in the Carpathian mountains, where light horse is at a disadvantage because of rough terrain. 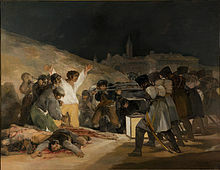 Picture - The Third of May 1808 by Francisco Goya, showing Spanish resisters being executed by Napoleon's troops. One of the most successful of the guerrilla campaigns was that of Robert the Bruce in the Scottish War of Independence when using strategies of ambushes, avoiding large battles, destroying enemy strongholds and using a scorched earth policy, the Scots forced the English out of Scotland without a single large-scale battle until the Battle of Bannockburn eight years after the start of the war. In the 15th century, Vietnamese leader Le Loi launched a guerrilla war against the Chinese. One of the most successful guerrilla wars against the invading Ottomans was led by Skanderbeg from 1443 to 1468. In 1443 he rallied Albanian forces and drove the Turks from his homeland. For 25 years Skanderbeg kept the Turks from retaking Albania, which due to its proximity to Italy, could easily have served as a springboard to the rest of Europe. In 1462, the Ottomans were driven back by Wallachian prince Vlad III Dracula. Vlad was unable to stop the Turks from entering Wallachia, so he resorted to guerrilla war, constantly organizing small attacks and ambushes on the Turks. During the Deluge in Poland, guerrilla tactics were also applied. In the 100 years war between England and France, commander Bertrand du Guesclin used guerrilla tactics to pester the English invaders. The Frisian warlord Pier Gerlofs Donia fought a guerrilla conflict against Philip I of Castile and with co-commander Wijerd Jelckama against Charles V.
During the Dutch Revolt of the 16th century, the Geuzen waged a guerrilla war against the Spanish Empire. During the Scanian War, a pro-Danish guerrilla group known as the Snapphane fought against the Swedes. In Balkan tradition, the Hajduk was an outlaw who engaged in robbery and guerrilla warfare against the Turks. In 17th century Ireland, Irish irregulars called tories and rapparees used guerrilla warfare in the Irish Confederate Wars and the Williamite War in Ireland. Finnish guerrillas, sissis, fought against Russian occupation troops in the Great Northern War, 1700-1721. The Russians retaliated brutally against the civilian populace; the period is called Isoviha (Greater Wrath) in Finland. In the 17th century, Marathas, on the Indian peninsula, under its leader Shivaji waged a successful guerrilla war against the Mughal Empire and founded the Maratha Empire which lasted until it was superseded by the British Empire. 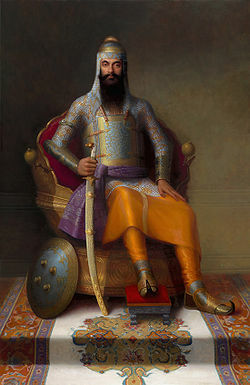 In the 17th and 18th century, Sikh fighters in the Punjab region waged successful guerrilla warfare against Mughal, Persian and Afghan invasions, until they founded the powerful Sikh empire under Ranjit Singh. In the mid 17th century the Colonists of New France were in conflict with the Iroquois Confederacy. Iroquois forces used hit and run tactics, harassment and avoided costly pitched battles. The colonists of New France began calling these Indian tactics La Petite Guerre because the tactics were meant for raiding as opposed to pitched battles. 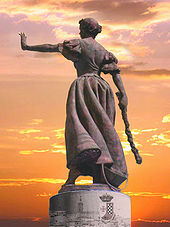 Under the tutelage of Wendake, Wobanaki, Algonquin and Ottawa tutors the habitants of New France learned La Petite Guerre and successfully used them against the Iroquois. In the early to mid 18th century Canadiens and Indian allies brought La Petite Guerre to New England and the Ohio Valley. New Englanders had also been adopting Indian scouting and raiding tactics since King Phillips War. During the French and Indian war La Petite Guerre came to front stage when the Ohio valley Indians defeated Braddock's expedition near the forks of the Ohio. In the Northeast, a New Hampshire backwoodsman, Robert Rogers, began to make a stir in the British military establishment for his success using the tactics of the "little war". British military leaders like Jeffery Amherst, John Forbes and Henry Bouquet understood they needed to learn and adopt the techniques and tactics of the little war, or be consumed, like Braddock. The British military establishment began adopting some of the tactics of La Petite Guerre as "light infantry." After the failure of the Irish 1798 Rebellion, Michael Dwyer led a guerrilla campaign from 1799 to 1803. He targeted local loyalists and yeomen, attacking small parties of the military and eluding any major sweeps against them. As the campaign progressed Dwyer became a household name. On December 1803 Dwyer finally capitulated. He was transported to New South Wales (Australia) as an unsentenced exile. He served as inspiration to later Irish Rebels during the Irish War of Independence a hundred and twenty years or so later. In 1808, when Napoleon's army began its occupation of Spain, bands of guerrillas that formed spontaneously were very effective in fighting the army, resulting in the English word "guerrilla" (see Etymology above). During the American Civil War of 1861-1865, the breakaway Confederate States for a time attempted to use guerrilla warfare as part of broader military strategy. The Confederacy’s Partisan Ranger Act of April 21, 1862 empowered President Jefferson Davis to commission officers who would recruit irregular forces. The law was controversial from the start, and many military commanders, including General Robert E. Lee, feared that the regular army would be unable to control the guerrilla units. This judgment proved to be correct, and uncontrolled guerrilla violence in Missouri, Arkansas, and western Virginia (and the lack of positive military results) led to the repeal of the act in February 1864. The repeal of the law, however, made little difference to many of the guerrillas. In Missouri, the violence did not subside until years after the war had ended. During the 1870s eastern newspapers depicted the continuing violence in Missouri as something that set the state apart from the rest of the country. During World War I (1914-1918) Paul Emil von Lettow-Vorbeck led a guerrilla campaign in East African which lasted the entire war. His innovative and creative solutions to daily problems proved to be insuperable for a succession of British commanders, allowing him to bleed Allied forces from European fronts. Although he never had more than 3,000 European and 15,000 native soldiers, von Lettow-Vorbeck consumed the efforts of over 250,000 Allied (mostly British) soldiers. Von Lettow-Vorbeck and the men of the Schutztruppe are little known outside Germany, but they were never defeated and have the distinction of being the only Germans of World War I to occupy British soil, however transiently. In the Irish War of Independence in 1919-21, guerrilla warfare was used in a successful attempt to allow Ireland to set up its own parliament and to leave the United Kingdom. However the same tactics failed to overthrow the Anglo-Irish Treaty in the Guerrilla Phase of the Irish Civil War. 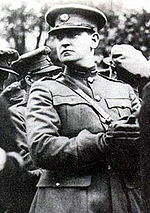 The guerrilla's leader Michael Collins is often cited as the father of modern urban guerrilla warfare. In the Spanish post civil war (1939-1952) there were a lot of rural guerrillas in the mountains, and any urban guerrilla in Catalux�a, Madrid, Mx�laga and Granada. Picture - Female Soviet partisans operating under Sydir Kovpak in Ukraine. Many clandestine organizations (often known as resistance movements) operated in the countries occupied by Nazi Germany during World War II. In March 1940, a Polish partisan unit led by Major Henryk Dobrzański completely destroyed a battalion of German infantry in a skirmish near the village of Huciska. In Yugoslavia, guerrillas under General Draža Mihailović, known as Chetniks, and communist guerrilla under Josip Broz Tito known as Partisans, engaged the Germans in a guerrilla war. By 1944 the Polish resistance was thought to number 400,000. The strength of the Soviet partisan units and formations can not be accurately estimated, but in Belarus alone is thought to have been in excess of 300,000. Tito's partisans numbered approximately 800,000 men by the end of the war. On the other side of the world, guerrilla forces in Southeast Asian countries like the Philippine resistance forces, were a mill stone around the neck of the Japanese. For example, tens of thousands of Japanese troops were committed to anti-guerrilla operations in the Philippines. Not only did this cause a drain on Japanese military resources, but the guerrillas prevented the Japanese from making the most effective use of the islands' resources (food, ore, civilian labor, etc.) in their war effort. And more importantly, Philippine guerillas provide vast amounts of intelligence data to Allied headquarters that is necessary to outmaneuver the Japanese forces in the time of the liberation campaign of 1944. In China, Muslim General Ma Zhanshan commanded 3,500 guerilla fighters against the Japanese, conducting attacks such as a raid on the Manchukuo treasury, attacking Changchun, the capital, and hijacking from an airfield six Japanese planes. In the 1960s the Marxist revolutionary Che Guevara developed the foco (Spanish: foquismo) theory of revolution in his book Guerrilla Warfare, based on his experiences during the 1959 Cuban Revolution. This theory was later formalized as "focalism" by R�gis Debray. Its central principle is that vanguardism by cadres of small, fast-moving paramilitary groups can provide a focus for popular discontent against a sitting regime, and thereby lead a general insurrection. Although the original approach was to mobilize and launch attacks from rural areas, many foco ideas were adapted into urban guerrilla warfare movements. The guerrilla can be difficult to beat, but certain principles of counter-insurgency warfare are well known since the 1950s and 1960s and have been successfully applied. The widely distributed and influential work of Sir Robert Thompson, counter-insurgency expert of the Malayan Emergency, offers several such guidelines. Thompson's underlying assumption is that of a country minimally committed to the rule of law and better governance. Some governments, however, give such considerations short shrift, and their counter-insurgency operations have involved mass murder, genocide, starvation and the massive spread of terror, torture and execution. The totalitarian regimes of Hitler are classic examples, as are more modern conflicts in places like Afghanistan. In the Soviet war in Afghanistan for example, the Soviets countered the Mujahideen with a policy of wastage and depopulation, driving over one third of the Afghan population into exile (over 5 million people), and carrying out widespread destruction of villages, granaries, crops, herds and irrigation systems, including the deadly and widespread mining of fields and pastures. Some writers on counter-insurgency warfare emphasize the more turbulent nature of today's guerrilla warfare environment, where the clear political goals, parties and structures of such places as Vietnam, Malaysia, or El Salvador are not as prevalent. These writers point to numerous guerrilla conflicts that center around religious, ethnic or even criminal enterprise themes, and that do not lend themselves to the classic "national liberation" template. The wide availability of the Internet has also cause changes in the tempo and mode of guerrilla operations in such areas as coordination of strikes, leveraging of financing, recruitment, and media manipulation. While the classic guidelines still apply, today's anti-guerrilla forces need to accept a more disruptive, disorderly and ambiguous mode of operation. "Insurgents may not be seeking to overthrow the state, may have no coherent strategy or may pursue a faith-based approach difficult to counter with traditional methods. There may be numerous competing insurgencies in one theater, meaning that the counterinsurgent must control the overall environment rather than defeat a specific enemy. The actions of individuals and the propaganda effect of a subjective “single narrative” may far outweigh practical progress, rendering counterinsurgency even more non-linear and unpredictable than before. The counterinsurgent, not the insurgent, may initiate the conflict and represent the forces of revolutionary change. The economic relationship between insurgent and population may be diametrically opposed to classical theory. And insurgent tactics, based on exploiting the propaganda effects of urban bombing, may invalidate some classical tactics and render others, like patrolling, counterproductive under some circumstances. Thus, field evidence suggests, classical theory is necessary but not sufficient for success against contemporary insurgencies..."
For Whom the Bell Tolls, an Ernest Hemingway novel which tells the story of Robert Jordan, an American volunteer attached to a guerrilla unit during the Spanish Civil War. Chetniks! The Fighting Guerrillas (1943), a 20th Century Fox movie on the guerrilla resistance movement of General Draza Mihailovich in German-occupied Yugoslavia during World War II. Undercover (1943), a British film produced by Ealing Studios, released in the US by Columbia pictures as Underground Guerrillas. The 1965 novel Dune features such warfare as conducted against House Harkonnen by the nomadic Fremen tribe, led by Paul Atreides. Season 3 of Battlestar Galactica which focuses on the guerrilla war against the Cylons by the former citizens of the Twelve Colonies on New Caprica. The Tomorrow series by John Marsden about guerrilla warfare after a fictional invasion and occupation of Australia. Che, Steven Soderbergh's two-part 2008 biopic about Che Guevara starring Benicio del Toro as Che. Red Faction: Guerrilla, a game in which the player is a guerrilla fighting an entrenched enemy. "Guerrilla Radio", a 1999 rock song by Rage Against the Machine. "Red Dawn", a 1984 American war film about a group of high school students become engaged in guerrilla warfare after their country is invaded by Cubans and Russians. "Predator", a 1987 film a science fiction film in which the rescue squad fight the Guerrillas in order to find the cabinet ministers. Robert Asprey, War in the Shadows: The Guerrilla in History. Fitzroy Maclean, Disputed Barricade: The Life and Times of Josip Broz Tito. Peter MacDonald, Giap: The Victor in Vietnam. Schmidt LS. 1982. American Involvement in the Filipino Resistance on Mindanao During the Japanese Occupation, 1942-1945. M.S. Thesis. U.S. Army Command and General Staff College. 274 pp.